Today, every enterprise is a data-driven enterprise, when considering the vast amount of data processed worldwide. While the benefits of big data have proven to be invaluable for business success, it's added pressure on the data privacy professionals responsible for enterprise data. Increasing public concern over consumer privacy is resulting in new data laws, such as the General Data Protection Regulation (GDPR) and the California Consumer Privacy Act (CCPA), causing enterprises to strengthen their data governance & compliance programs. 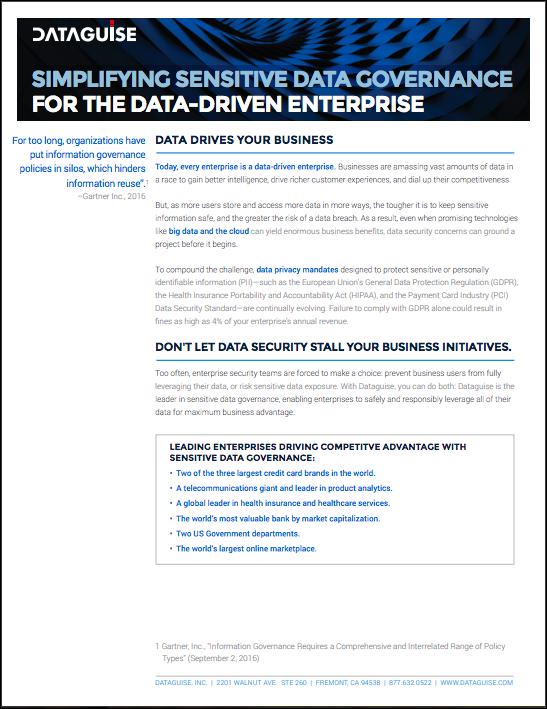 Dataguise's DgSecure provides enterprises with the solutions needed to address these growing concerns. Automate data compliance with pre-defined or customized policies to locate GDPR and other sensitive data across all repositories within your organization. 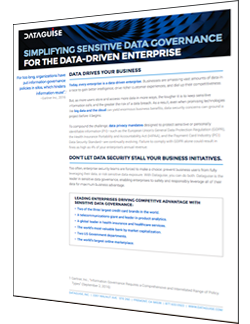 Ensure data compliance with powerful data masking and encryption solutions, allowing more teams access to valuable data while eliminating the risk of exposure. Minimize data breaches with continuous monitoring that uses behavioral analysis to send alerts for potential threats when abnormal user activity is detected. Curious about Dataguise's data governance and compliance solutions?